In 2007, doctors Sumner L. Koch Burn Center reported a case that a young woman hospitalized and received skin grafts, and was left with two 3-centimeter bald patches at the top of her head after. She got chemical burns while highlights her hair at the local salon. Although such severe injuries are rare, hair straighteners and dyes can cause everything from itchy, raw skin to trouble breathing. Some consumen had allergic reactions at their faces and eyelids, they swell or break out in hives after salon hair treatments. How to prevent this chemical burn happen to Me? Have your stylist test any chemicals on the inside of your elbow the day before you get your hair done to make sure you’re not allergic. If you feel a burning sensation on your scalp while you have color on your hair, alert your stylist and have her wash the chemicals off ASAP. 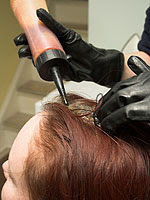 Make sure your technician is paying attention when wielding hot blow-dryers, curling irons, and flat irons. Most of hair salon even the top one used combs and brushes at their stations. But don’t you know that those styling tools can carry fungal infections such as ringworm, dandruff, and lice. Lice can spread through hair salons and not just low-end places. I Don’t Want Get Any of Those Creatures, How Would I Do It? If you see that the stylists are using combs and brushes on client after client, bring your own during your next visit. Having someone else shampoo your hair is a true pleasure of a salon visit. In rare instances, though, tilting your head back can cause a tiny tear in an artery in your neck, triggering a stroke. How Can I Protect My Self? Tilting your head backward into a sink while shampooing can alter blood flow to the brain, but researchers at the University of Medicine and Dentistry of New Jersey reported that using a support, such as a towel, minimizes the problem.